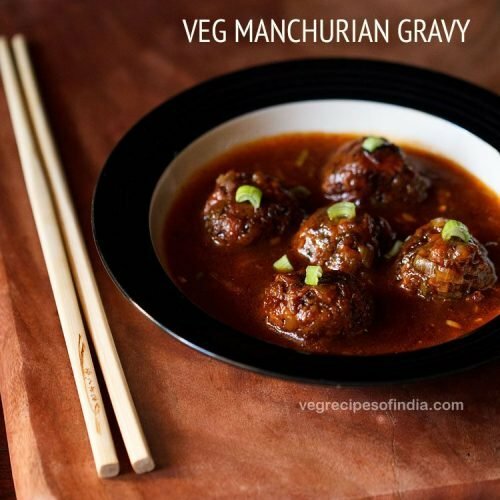 delicious veg manchurian gravy recipe from the indo chinese cuisine. take the finely chopped or grated veggies in a bowl. you will need ½ cup finely chopped red cabbage, ½ cup grated carrot, ¼ cup finely chopped capsicum (green bell pepper), ¼ cup finely chopped french beans and ¼ cup finely chopped spring onions. you can also add regular green cabbage instead of red or purple cabbage. then add the dry ingredients – 2 tablespoons corn starch, 2 tablespoons all purpose flour (maida), ½ teaspoon black pepper and ½ teaspoon salt or add as required. mix and gather the whole mixture together. then kind of mix and knead so that the veggies leave water and you get a dough like mixture. knead like you would knead a dough. then take a small portion of the mixture in your hands. press and roll it in your palm and and make a round veggie ball. make all veggie balls this way and keep aside. heat oil for deep frying in a kadai or pan. add a small piece of a ball to the hot oil. if the balls does not stick or settle down at the bottom of the pan, but comes up steadily the oil is ready for frying these veg manchurian balls. if the balls break, then some more binding agent is required. so you can add 2 to 3 teaspoons of some more all purpose flour (maida). gently place the balls in the hot oil. the oil has to be medium hot. too much heat and the manchurian balls will be browned from top and uncooked from inside. less hot oil will make the balls absorb too much of oil. when cooked from one side, turn the balls with a slotted spoon. fry the balls till crisp and golden. remove them with a slotted or perforated spoon and drain as much as oil as possible. place the fried veg manchurian balls on kitchen paper towels. for a low fat version, you can cook the veggie balls in an appe-appam pan or æbleskiver pan. fry the veg manchurian balls this way in batches and keep aside. in a small bowl take the following three sauces – ½ tablespoon soy sauce, 1 tablespoon tomato ketchup, 2 to 3 teaspoons of red chili sauce. mix the sauces very well and keep aside. in another small bowl take 1 tablespoon corn flour and 2 tablespoons water. mix very well and keep aside. heat 1 to 1.5 tablespoons oil in a pan or wok. add 4 tablespoons chopped spring onions, 1 tablespoon finely chopped ginger, 1 tablespoon finely chopped garlic and 2 green chilies (finely chopped). stir fry on medium flame till the onions turn translucent. now add the mixed sauces. stir and mix very well. add 1 to 1.25 cups water. mix the corn flour paste again in the bowl (as the corn flour settles at the bottom) and then add in the pan. as soon as you add corn flour paste, mix very well so that there are no lumps. continue to stir and mix when the veg manchurian gravy is cooking. simmer till the sauce thickens and you see a glaze in it. there should be no raw taste of the corn flour in the sauce. cooking sauce or gravy takes about 3 to 4 minutes on a medium flame. if the sauce is too thick, then you add some water. if it is too thin, then you can add some corn flour. when the veg manchurian sauce thickens, add ½ teaspoon black pepper powder. season with a bit of salt. do keep in mind that the soy sauce, chili sauce and tomato ketchup already has salt in it. so add less salt and as per your taste preferences. add ¼ to ½ teaspoon sugar. mix very well. then add the fried veg manchurian balls. also add 1 teaspoon of rice vinegar or regular vinegar or apple cider vinegar. gently stir and coat the veg manchurian balls in the gravy. switch off the flame add chopped spring onion greens. serve veg manchurian hot garnished with some spring onion greens. veg manchurian gravy goes well with veg fried rice, plain rice and even bread or the chapati or rotis. the best part of any chinese dish is you can change the consistency as per your liking. if you want a thin consistency, add some veg broth or water. if you want a thick consistency, add a few teaspoons of corn flour paste. this dish thickens after it cools down. so when reheating you may have to add some water. i have not added any msg to the recipe. if you want a more restaurant style effect, you can do so. but a word of caution. msg or mono sodium glutamate is not good for the health. remember to fry the veg manchurian balls on medium heat. if they are fried on a high heat, then the outside will get cooked and the inside will be not cooked leaving a doughy taste in the mouth. if they are fried on a low heat, they will absorb oil and this will make them oily and soggy. i like the sweet sour taste of indo chinese food and hence i have added sugar to the recipe. also as the soy sauce i use does not have any sugar added to it. you may avoid this or check the ingredients list in your soy sauce if sugar is there in it or not. you can also add tomato sauce for some tang and sweetness.